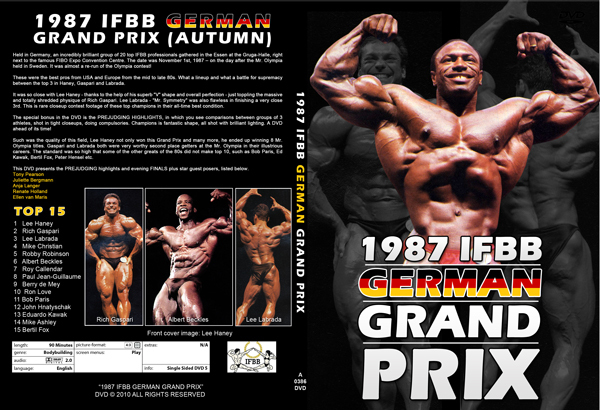 Held in Germany, an incredibly brilliant group of 20 top IFBB professionals gathered in the Essen at the Gruga-Halle, right next to the famous FIBO Expo Convention Centre. 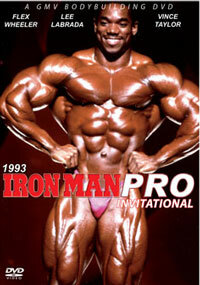 The date was November 1st, 1987 – on the day after the Mr. Olympia held in Sweden. It was almost a re-run of the Olympia contest! These were the best pros from USA and Europe from the mid to late 80s. What a lineup and what a battle for supremacy between the top 3 in Haney, Gaspari and Labrada. It was so close with Lee Haney - thanks to the help of his superb "V" shape and overall perfection - just toppling the massive and totally shredded physique of Rich Gaspari. Lee Labrada - "Mr. Symmetry" was also flawless in finishing a very close 3rd. This is rare closeup contest footage of these top champions in their all-time best condition. The special bonus feature in the DVD is the PREJUDGING HIGHLIGHTS, in which you see comparisons between groups of 3 athletes, shot in tight closeups, doing compulsories. Great champions is fantastic shape, all shot with brilliant lighting. This is one of the best quality grand prix recordings of the eighties and as such is a DVD ahead of its time! 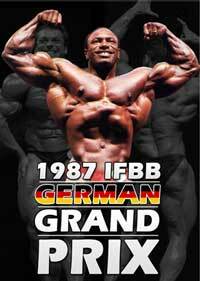 For the many Haney fans, it is one of the few DVDs showing LEE HANEY winning a Grand Prix at his peak. Not to be missed! Such was the quality of this field, Lee Haney not only won this Grand Prix and many more, he ended up winning 8 Mr. Olympia titles. Gaspari and Labrada both were very worthy second place getters at the Mr. Olympia in their illustrious careers. 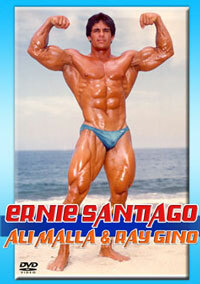 The standard was so high that some of the other greats of the 80s did not make top 10, such as Bob Paris, Ed Kawak, Bertil Fox, Peter Hensel etc.